Normally, I’d read the entire book before writing a review, but this can’t wait. I’ve skipped around and read several sections and the writing is good and engaging — almost as engaging as the photographs. This is a book you should buy for every photographer you know and probably everyone else, too. But you should have it dropped shipped to the recipient because if you get your hands on it, you won’t be able to put it down. There are almost no famous photographers, especially this century when photographs come and go before our eyes faster than we ingest their meaning. Nevertheless, Steve McCurry is a household name for his work in war-torn countries. He’s well-known for his portrait of the “Afghan Girl, Sharbat Gula.” That portrait is included in the book, as well as a follow-up portrait made years later of the same woman. While that’s an important and striking photograph, it’s not the only noteworthy portrait he’s made and this book is chock full of moving photographs and the stories behind them. In an age when we see thousands of photographs each day and everyone knows someone who is a photographer, Steve McCurry is a photographer everyone knows and everyone has seen his work. 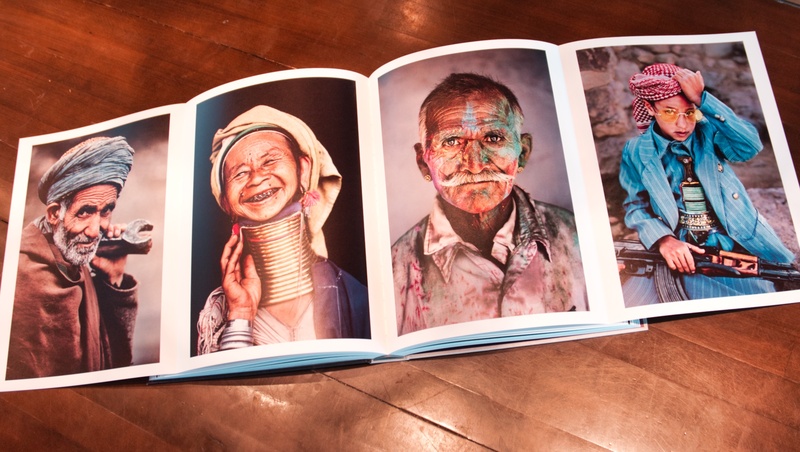 McCurry’s sister, Bonnie McCurry, wrote the book. The two corresponded continuously during his travels and she (wisely) kept all his postcards and letters, and I gather that she helped manage his proposals, as well. As I said, I’ve only read small portions, but I can’t wait to finish it. Boy, I hope not (and there’s not). This book deserves to be held in your hands and touched and flipped through. An eBook version would be a discredit to the photos and the design. It’s big and beautiful. The paper has a marvelous hand and its satin finish shows off all the depth and detail of every photo. The impact of the foldout spreads couldn’t be imagined on a tablet, let alone a phone. Get the paper version and it’ll become an heirloom. Photographers of all kinds need this book, and so does everyone else you know. It’s full of history and it brings the world into your home through photographs. It shows you what a great photo looks like and it shows you how to find a story in a single image. I’ve traveled quite a bit, but this book makes me yearn to see the world. I was shocked that the cover price is only $70, and I found it on sale at Amazon for just $43.40. I think this book is wonderful and worth far more than the cover price. I’m disgusted seeing this and have no respect for this guy. He never took responsibility for his lies and actions yet blamed an employee. From photoshopping many images to staging images with his assistants making it seem like real life in India. It was his arrogance in defending his actions that really made my blood boil. Any book about this guy needs to include this information. Thanks for that link. I read the whole thing. I don’t see how this applies to a book written by someone else, but I was interested to see the article. I’m still impressed with this artist and the book is a phenomenal compilation of masterful photographs.